Hello! My name is Michelle Dorsey of SewMichelle.com. I have been teaching sewing and embroidery classes in the Dallas area for about 15 years now. I wanted to share my tutorials with others not in this area, so I began posting them on my website, SewMichelle.com I tend to gravitate toward tote bags and purses, but also love making most any project that is quick and easy. I like to call them instant gratification projects. I try to keep that same philosophy when writing patterns. I’m “sew” excited to be a part of this year’s National Sewing Month’s celebration on The Sewing Loft. Thank you Heather for inviting me to participate! Sewing is a huge part of my daily life, some might even say I am a tad obsessed with it and all that it implies. I love to design projects, write patterns, and digitize embroidery designs — but sometimes I just enjoy pushing the fabric under the presser foot to merely get my mind off of the daily grind. Know the feeling? Because I have a day job, my sewing time is limited to nights (yes, I am a true night owl) and weekends. Therefore, I am always trying to find shortcuts or easier ways to do things to make my sewing time more productive. Years ago I was in a class and the teacher was demonstrating these funny looking scissors. I noticed how easily she was able to cut around an applique with speed and accuracy and immediately I was hooked and knew I NEEDED a pair of my own! I realize that asking someone who sews about her favorite scissors is a lot like asking a woman about her favorite pair of shoes — it really depends on the person and their likes and needs. Personally, I love applique scissors. They are incredibly useful when grading a seam, trimming a neckline and cutting bulky seams, but my favorite use for them is, not surprisingly, applique. I simply love to embroider. I think adding a little embroidery to your sewing projects only enhances the project, making it more unique and personal, thus making it “uniquely yours”. I especially love to applique using my embroidery machine. 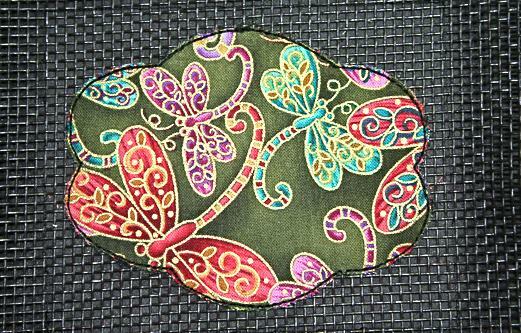 It allows you to enhance your project quicker with color and texture by adding fabrics (even multiple layers) in a shorter amount of time than a stitch intensive embroidery design would take. One of my favorite tools when machine appliqueing are these particular applique scissors (aka: pelican or duckbill scissors). The rounded part of the blade on one side serves as a safety precaution to keep from cutting the base fabric when appliqueing. If you have ever had this misfortune happen, then you’ll understand when I say it will make you want to cry to discover that you have cut through the under fabric by mistake and have to start the project all over again. Using applique scissors will help make your projects ooooops – free when trimming an applique. 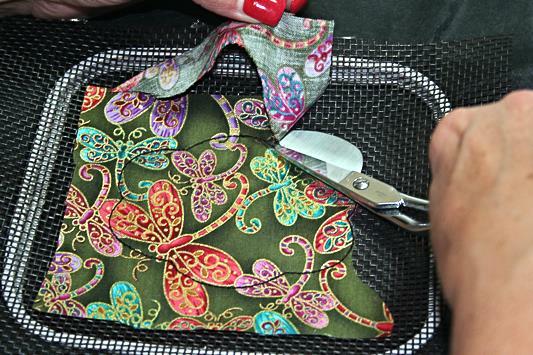 Let me show you how I use them during the machine applique steps while making my Screen Cosmetic Bag. It’s a double applique frame so you can get lots of practice using your appliqué scissors. The full tutorial can be downloaded at SewMichelle.com. First, hoop your tear away stabilizer. Then proceed with the embroidery steps for applique placement. Place the fabric over the stitched guidelines. 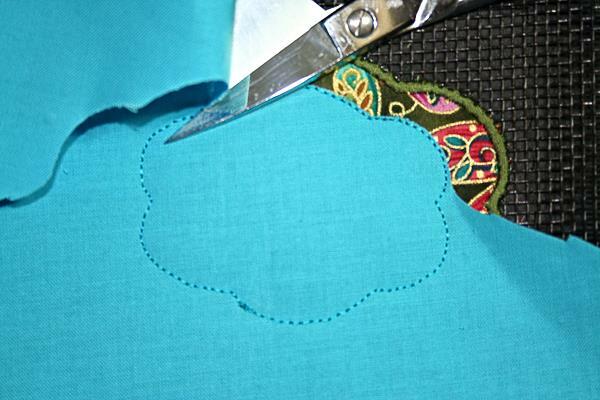 Use your duckbill scissors to trim close to the applique, taking care not to cut through screen. See how the wide “bill” or “paddle” slides under the top layer of fabric and pushes the bottom layer away to allow cleaner and more accurate cutting? 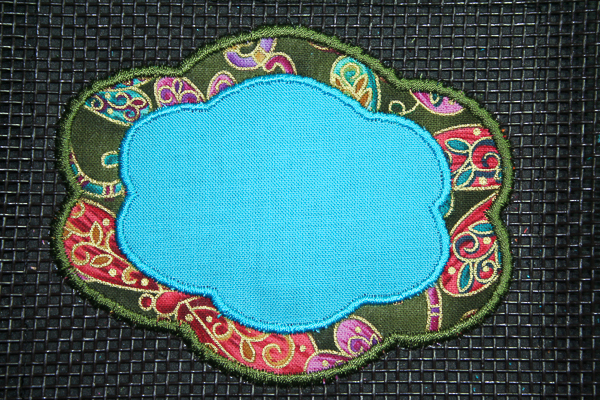 Trim around all of the machine embroidery applique frame. Continue with remaining embroidery steps. Once the design reaches the next applique frame, repeat the same applique steps. See how close the scissors allow you to cut? It makes all the difference in the world when working with appliques. After all, the closer and neater the cut, the nicer the finished stitches will look around the applique. 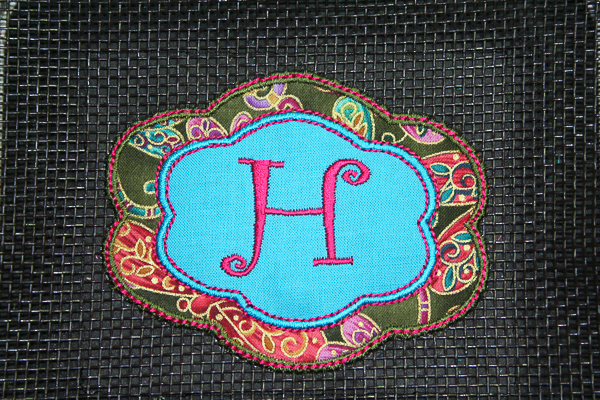 Adding the final steps to finish off the machine embroidered applique should bring your monogrammed frame to look something like this. Again, I’d like to thank Heather for having me as a guest. Remember to get the complete tutorial for my Screen Cosmetic Bag with the FREE machine embroidery applique (and many other fun tutorials) at SewMichelle.com. Feel encouraged to drop me a line at SewMichelle@outlook.com, visit me at my website: SewMichelle.com, or stop by my Facebook page. Wow, that is a super cute project Michelle! I am totally hoping over to your site to grab the how to. It will be perfect to take to market next month! Plus, more good news….. several of Michelle’s patterns will be included in the giveaway. Stay tuned for more giveaway information and a fun project from Alison Glass is on the way! Where can I purchase the scissors? Click the large scissor image Ruth Ann and it will take you direct to the scissors at Joann’s. Otherwise, you can find them at your local sewing and craft store. Very cute bag! I haven’t ventured into appliqueing with my machine yet, but I might have too now once I get a pair of those scissors. I love what you said about instant gratification projects, that is so me. I can’t quilt, I put off larger projects because I’m self taught & slow and know that they will take me way longer than I think will and I also work full time with sewing being one of many hobbies. Wonderful product. Left-handers beware; you need to find left-handed applique scissors to get the same results. What a great pair of scissors and cute bag! Heading over to check out your website. Thanks! Yes very cute and I also love my duck bills. Thanks for the free applique frame can’t wait to put it on a bag of my own. My number one favorite everyday sewing tool. I rarely use my long blades, saving them for cutting out long pieces of fabric. Making your seams seamless perfects the final product. I learned these concepts in couture school. Great hint Michelle. I love my applique scissors and look forward to getting a pair of the smaller size. Thanks for keeping us up to date on new tools. Hi I do not have an embroidery machine, but I like to make bags, and my granddaughter loves to embroider. Check on Alisons post that Heather has, it has great ideas, and the colors and patterns are awesome……..
these look so good – thanks for sharing. I got quite excited seeing these. Then I remembered that I’m left-handed so these are no good to me. Wendy, these are totally available in a lefty version. I did a quick search and found a bunch on amazon. They are really are fantastic to work with! I can not live without my applique scissors and I am not even a machine embroidery person! Thanks for sharing this fabulous tool today. Thanks for suggesting using the scissors for grading seams! Very useful!